In my last post, I talked about how growing a community starts with your product. I referenced how the aim of growing a community is to make people fundamentally care about what you do. Making people care creates defensibility around your company. Growth becomes organic, and future possibilities bigger. Eager anticipation awaits what comes next, and competitors become less relevant. 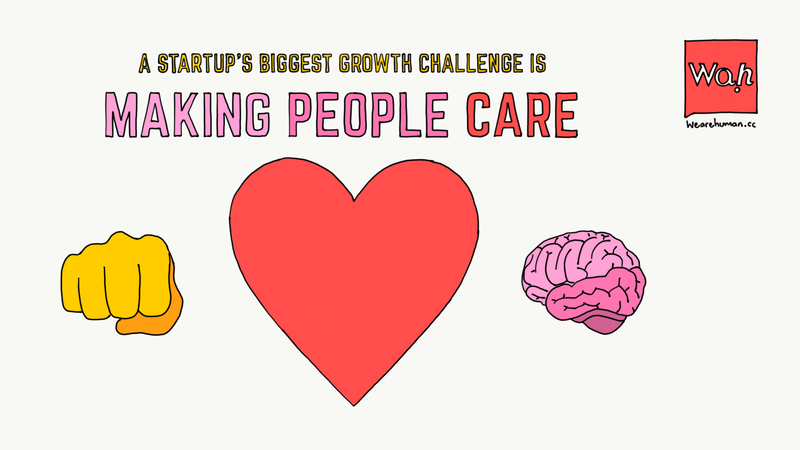 Making people care is brand building. Yet so many founders and business leaders misunderstand what that really means. A strong brand creates a feeling — of desire, that people want. A feeling that satisfies their intrinsic motivations. Motivations that come from their own personal needs and align to their own value set. That feeling is then felt through the entire experience of the company — from the products, to customer support, to the culture and thought leadership that comes from within. Growth becomes a consequence of this. People want to share that feeling with others. They want to come back and experience more of it. This usually means: they don’t understand it and have no intention to try to understand it. The problem I often see is that technology startups just create tools, rather than brands and communities. Yes, those tools save time by making existing processes more efficient, but they’re throwaway. They don’t impact people’s lives enough for them to tell their friends and colleagues. These tools simply improve established behaviours, rather than creating better habits. Growth becomes organic; people tell others about it. Acquisition becomes simpler; the value proposition is more real to new users when shared by their peers. Retention is more natural; the emotional connection creates lasting memories and real value that improves lives. Users are happy to invest their time and intellect, keeping them coming back. Brand equity is built up because your audience understand and believe in the bigger mission you’re striving for, creating constant buzz; imperfections and mistakes are easily forgiven and new product launches become eagerly anticipated. When we started Kahoot!, our ambition was to create a brand that changed the way people learn for the better. Here are some of the strategies we used to make people care about what we were doing. Mission-driven brands support causes and purposes higher than themselves. Causes they care about, and that other people also care about. They have a clear view for how to improve individual’s lives and the wider world. They make sure that view is felt throughout every touchpoint in the company, from their products to customer support. They engage in thought leadership, having strong opinions that show what they stand for, and that people can connect with. This is entirely genuine, aligned with their world view and personality. They use their initiatives to set examples and a standard for how to behave, showing integrity and passion for the problems they’re solving, embodied by every employee and felt by every user or customer. As we started Kahoot!, I attended a roundtable discussion on the topic of ‘Tablets in the classroom’. Aside from the misguided fear in the room about kids using Facebook in class, the ‘wisdom’ the ‘experts’ came up with for how to maximise these new devices was: “Why don’t we take existing textbooks, digitise them, and put them on the tablets?”. Hmmm. My counter-argument was that rather than trying to replicate existing classroom behaviours, shouldn’t we be observing how and why these devices are popular beyond the classroom, in order to design for more positive behaviours within it? We designed Kahoot! to break up established classroom behaviours — sitting in rows of desks, heads buried in textbooks and information parted from the teacher that goes in one ear, and out the other of learners — to create a more engaging, social and inclusive learning experience. When we introduced Kahoot! to a classroom for the first time, we knew we were onto something: students were looking up and discussing content with friends, gathering around shared screens, fist pumping and cheering, dancing and standing on tables! This was all deemed positive by the teacher, because they showed behaviours unseen before. This was achieved through behavioural design. Technology became an enabler for improved human behaviours, rather than solution itself. Designing for behaviour means understanding the intrinsic motivations of individuals, and finding ways to deeply reward them that encourages new behaviours. The truly impactful brands are built on such behavioural insights. Most products that get some level of adoption are designed for the mind (“it’s logical and sensible to use them”) and the hand (“they’re tangible and practical to use”). But what really sets apart the brands that are making a difference is that they also create an emotional engagement with the user. They design for the heart. Emotional engagement is often generated through great copywriting, beautiful use of colour or engaging game or sound design. But most importantly, it’s through the intrinsic and extrinsic reward mechanisms designed into the product that positively influence their lives. Using EdTech as the example again, many products are designed like boring textbooks rather than aiming to create emotional bonds with learners who need support in reaching their potential. It doesn’t have to be that way! By bringing emotion into the learning experience, the level of engagement with the Kahoot! brand took off — as seen by teenagers around the world collaborating on the Kahoot! Memes Facebook page or uploading their own remixes of the Kahoot! soundtrack to YouTube. It sounds obvious, but by being inclusive your products become relevant to a wider audience. Yet so many companies simply design for the “average” user, which when you think about it actually represent a minority — because everyone’s different! By adopting an inclusive design philosophy, you understand not just the demographic differences in your potential audience, but also the diversity in ability, relevance, context and motivation. Only with these insights can you truly create products that satisfy all their needs. This creates much more sustainable growth. Real, genuine value is delivered to improve the lives of as wide an audience as possible. New user segments grow, and new opportunities emerge. Ultimately, people will care about what you’re doing, because they realise you care about what they’re doing. Revisit your company’s mission statement — does it reflect the higher purpose you’re aspiring to impact (that your audience identifies with), or is it too heavily focused on what the company itself is doing? Pick some of the most common use cases, and map out the behaviours of your users if they don’t use your product vs if they do use your product. Is the behaviour shift substantial enough to genuinely improve user’s lives? Run the Gamestorming Heart, Hand, Mind activity on your own product to better understand what emotional engagement it currently delivers, and where new opportunities might exist. Check out the Kahoot! article on inclusivedesign.no to understand how an inclusive approach helps make people care and fuels growth. Good luck, and please let me know how it goes in the comments below! If you’ve got this far, thanks for reading… I would hugely appreciate some claps 👏 and shares 🙌 so that others can find it! We Are Human creates purpose driven organisations striving for social and commercial impact. We are mostly known for co-founding and incubating Kahoot!, “the world’s fastest growing learning brand”, launched in August 2013. By May 2017, we had scaled Kahoot! to reach 50 million people around the world every month, along with our co-founders and a highly dedicated team. Building companies that put human beings at the centre. Founder We Are Human & Kahoot!. Design, business, startups, tech, education. Musings about entrepreneurship, growth, design thinking and leadership from the co-founders and incubators of Kahoot!.